Baldur’s Gate was released in 1998 and set the standard for single-player team-based role-playing games. Four years later (give or take a couple of months), BioWare released Neverwinter Nights – a game that picked up the flag that Baldur’s Gate had set as the benchmark and moved it forward. In 2007 The Witcher entered the RPG scene and gave the genre a more-adult feel, but that was very much a solo-character effort. When it comes to the concept of the team format, of tactical combat, nothing has really moved the genre forward … until now. 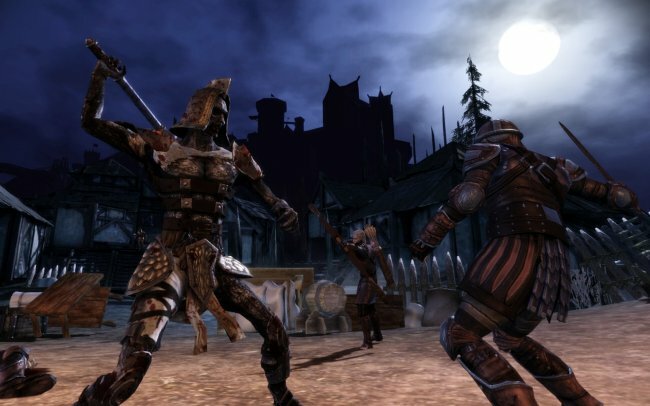 Dragon Age: Origins does not merely move that flag forward a few feet, it scales the mountain of RPGs, raises a new banner, a new high bar, and then challenges the genre to play catch-up. It is a lofty achievement, full of twists in the plot, building on a dynamic rarely seen in gaming at all, and telling a story that is amazing in its scope. The story begins 400 years prior to the events depicted. A group of mages, intent on expanding their base of power tried to breach the gates to heaven, where the Maker resided, to tap that power base. They were repulsed and cast back down to the lands of Ferelden, becoming twisted and malformed in the process, and finally became known as the arch-demons. In their wrath and rage, they cast a Blight upon the land, dredging up creatures created and twisted by dark magic, known as the darkspawn. The army of foulness swarmed across the lands of elves, dwarves and men. As the victory of the darkspawn seemed at hand, a new force made its presence known – the Grey Wardens. These warriors, selected and trained from the ranks of all of the peoples of Ferelden, turned the tide of the war and defeated the darkspawn. But once the lands were secure, the Grey Wardens slid into anonymity and were all but forgotten. As DA:O opens, the darkspawn are once again starting a bid to take over the lands. Players created a character from one of six origins, complete with a rich back-story, and begin the task of cleansing the lands once again. But nothing is easy. For those expecting spoilers, you will be disappointed. What good would it do anyway? DA:O is a game where choice matters and while there are some linear events at the beginning, and toward the end of the approximate 120 hours of gameplay (if you do all the quests – main story arch and follow through on all the side quests that dot the game’s landscape; and there will be downloadable content/quests available when the game launches), but the elements in between present a sandbox world where you choose what course of action you wish to take. Not only can you determine where you want to go, but there is the chance that characters within your party dynamic may not agree with your decisions and instead of being allies, they may turn on you and force you to a fight to the death. As mentioned, there are six origins in total. There are three main character classes – warrior, rogue and mage, which are defined through the allocation of points you receive at levels 7 and 14. If you have a rogue, that can break down into ranger, assassin, duelist or bard. Those points, when assigned, open up new skill trees. The three racial backdrops are elf, human and dwarf. There are different back stories for the race and class (mage is not an option for the dwarf). For example, if you go human, you will find yourself as either a novitiate in the Circle of Magi tower, learning the craft of magic under the watchful eye of the First Enchanter and the Templars with a bit of a clouded back-story. But choose either warrior or rogue and you will be of the noble house of Cousland, and the story is much more defined. Each of these early paths leads you to a character named Duncan, who is recruiting for the Grey Wardens. A Blight is upon the lands and the Grey Wardens, once the guardians who rode into battle on griffons (the griffons, sadly, are now extinct) are looking for a certain kind of warrior to stand shoulder-to-shoulder with the king to battle the evil plague. As the game progresses, you will meet new characters, each with a unique personality, and each with his or her motivations or agendas for joining your cause. These characters for the basis of the pool you draw from when creating a party of four to venture across the lands. You may find yourself drawn to certain characters, leaving others in your base camp, but don’t worry – the characters left behind will not cease to level. As the characters in the main party fight and level, those left behind level as well. Should you reset the party – each character has specific traits that define the role he or she would play in the group dynamic – you will be allowed to allocate their points earned while at the camp. You may have an assassin join you (Zevran is an interesting character, and apparently bisexual, but more on that element in a moment) at level 8, but you are comfortable with your own character, Wynne (a Circle of Magi character with healing proclivities), Morrigan (the daughter of the famed Witch of the Wilds and a powerful damage dealer) and Alistair (a fellow Grey Warden, former templar and decent tank). The main body of characters moves, during the course of their adventures, from level 8 to 11. But a new quest line has need of an assassin’s skills and Zevran is called to action. When you first re-enter the world after selecting your party, you can level Zev up to the current level of the bulk of the party members. DA:O is very much a dark epic, with themes that are not appropriate for younger children. Not only does evil cast its pall over the environment of the game, but there are side elements. For example, each of the created characters can, surreptitiously, engage in sexual relations with another. A meter on the character sheet tracks how one character likes your main character and dialogue choices can lead to intimate moments that are alluded to. There are bisexual characters in the storyline. But the relationship between the characters is an overriding factor that plays out as you move through the game. As a choice is made, you will see how that resonates with those within your party. Should you lose a lot of favor with a party member, he or she may leave your party, or may even attack you for a decision made. At one point, during a quest the decision was made to cleanse a building rather than risk the corruption that seemed to be endemic therein from spreading. One party member vehemently opposed that decision and turned on the other three. The only way through the scenario was to kill the revolting party member and move forward with three members in the party. However, because of the ability to save often (F5 for quick saves, or ESC to open the main menu interface and create a saved game file), the scenario was immediately replayed, a different path taken and there was not a revolt among the party members – though not all agreed with the new decision. That is, perhaps, part of the charm of this game – there is no true right or wrong path through the game. Each choice made may have outcomes that are immediate or down the road. Another dynamic of the game is the ability to pause at any moment and change the tactics of the party. Hitting the spacebar pauses the game and you can then issue orders. 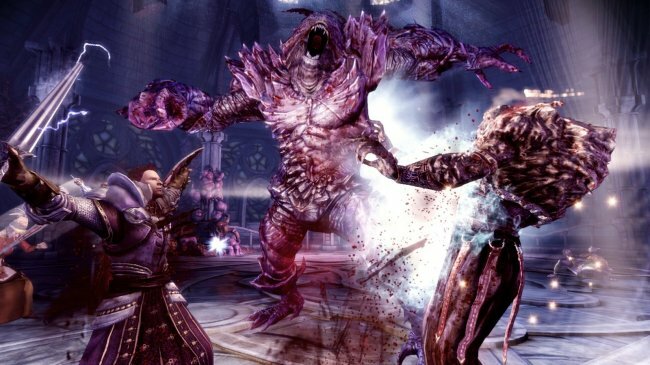 You can, for example, tell Alistair that if a mage, who is a member of the party, comes under attack, and his or her health hits 75%, that he is to break off from his current target, taunt the enemy attacking the mage, shield bash and then hold that targets attention to allow the mage to step back beyond the edge of the fray. Or you can pause the game and have a healer gulp a mana-regeneration potion and cast a group heal. If the battle is going badly (and remember, this is a war, so there is no shortage of combat opportunities), you may wish to pause the game and readjust the difficulty setting on the fly. Not only can it be lowered at any time, but you can also raise it higher. When it comes to the battle itself, the game offers players to view the game from a third-person perspective, or you can go old-school with the top-down perspective that evaporates ceilings and allows you to gain a wider perspective of the battlefield. This is handy for sending a charging tank to the ranged attackers on the peripheral of the battle that are plunking your tanks to death. You can allocate targets for each of the members, and even designate the type of skills you wish them to use. The AI of the game, though, is quite bright and party characters will do some things automatically – such as the healer will watch the central tank’s health and use his or her healing spells appropriately. The combat skill known as ‘kiting’ is also a viable option. The game’s combat does play out in real time and should you have a couple of party members fall, leaving only a healer alive, that healer can run, gulp mana potions, wait for the timer of the resurrection spell to reset and then revive fallen companions. The game’s controls are mouse-and-keyboard driven. You can point and click to move, or use the WASD keys. Right clicking with the mouse is the action command. The character traits available for each class do play a role. Those traits – which include strength, dexterity, cunning, wisdom, magic, and constitution – may be attached to a weapon or piece of armor. You may run across a breastplate that requires 25 strength to use, or a two-handed mace that requires 36 strength. Conversely, a bow you find may require 31 dexterity to be able to use. Each time your characters level, they are given three points to spend, and players can really define their characters abilities through how they allocate the points. You can also really mess up a character and render him or her almost useless within the default profession. Once the points are allocated and the game is advanced, there is no way to go back and reset those points. In addition to weapons and armor found that naturally have buffs on them, you can also find runes that can be used by a dwarf you will eventually have in your base camp to enchant weapons. Some weapons cannot be enchanted while others may have one or two enchantment slots. DA:O is a single-player experience, but BioWare is creating a robust online community experience that allows players to upload character biographies, screenshots, heroic achievements and even stories to embrace the role-playing element of the game. The development team has done a sterling job of creating emotional content within the game’s atmosphere. The sound texturing, driven by Inon Zur’s music, is carried forward by background conversation between party members and even the jingling of chain armor as you run. Yes, there are load points as you transition from one area to another, but this is negligible to the overall gameplay. The voice acting for the characters is wonderful and really brings a wonderful flavor to the whole game. Graphically the game hits a high point as well. Lip synching for the dialogue (and there is a lot of that) is excellent, and faces will emote feelings as will body language. The characters of the game, from the party members, to the side members you will encounter on your travels, are vibrant and alive. A few glitches were encountered with the build received, and some of the load times were a bit long. There are also times when you may find yourself running from one zone to another and back again as individual parts of an overall quest are achieved, rather than moving into a zone and completing all the quest requirements before returning for the reward. The game also does allow for a bit of hand-holding at times and there can be set conditions for elements to happen within the game sphere. If you get to the halls of the dwarven kingdom, for example, you may find yourself bouncing from the Proving Grounds to the Diamond District to The Dust (the area for the caste-less and the dregs of dwarven society) with a frequency that can be a bit long in the tooth, so to speak. 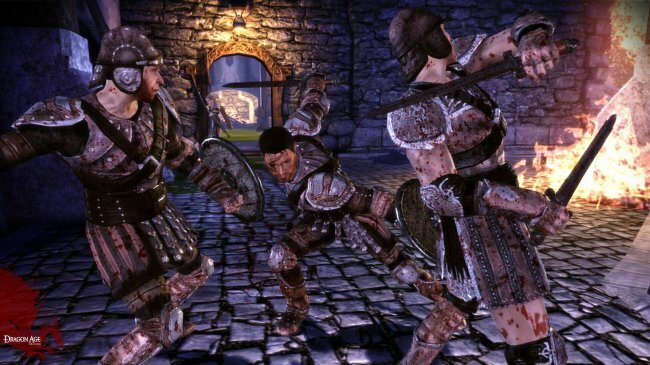 Dragon Age: Origins is like that really good book that you don’t want to put down. There is trepidation in the journey with each step taken, each choice made the subject of second guessing; there in anguish in the sacrifice of war. There is glory in battle and victories won, a test of mind, of tactics and skill rarely encountered in a game and seamlessly combined in this title. While there is an ending, you find yourself not truly wishing to get to it, if only to prolong the experience, but hungry nonetheless to succeed and save the lands. BioWare stated that this was a return to its roots in the RPG space and it is a glorious return. As single-player RPG games go, DA:O is a crowning achievement. This is a must-own PC title.